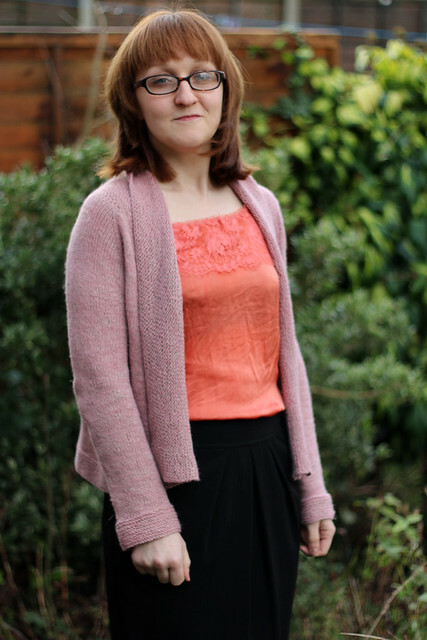 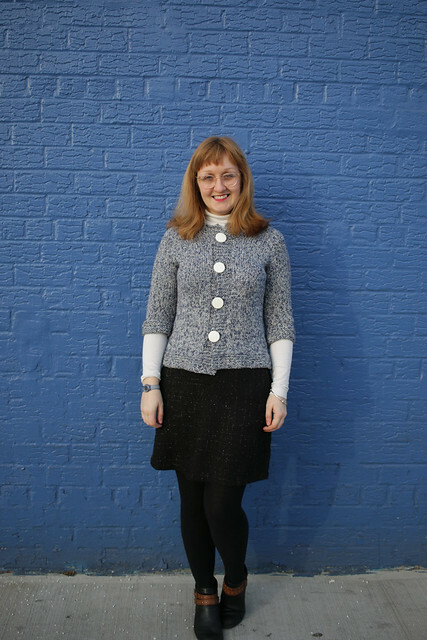 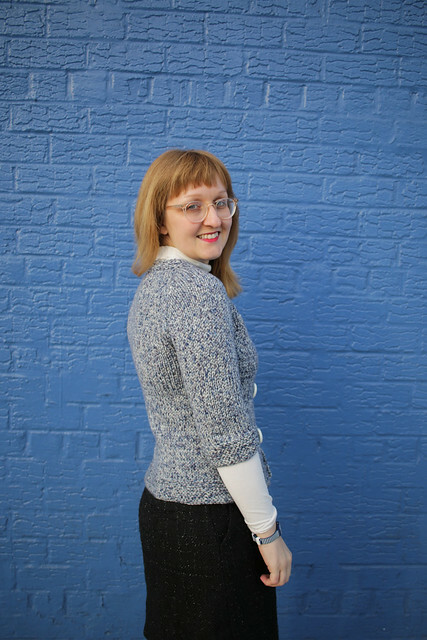 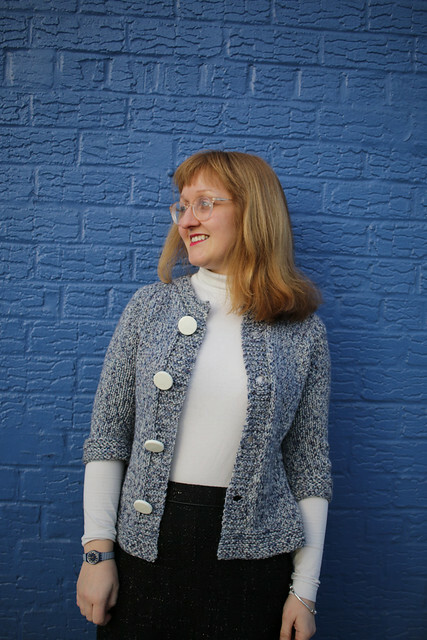 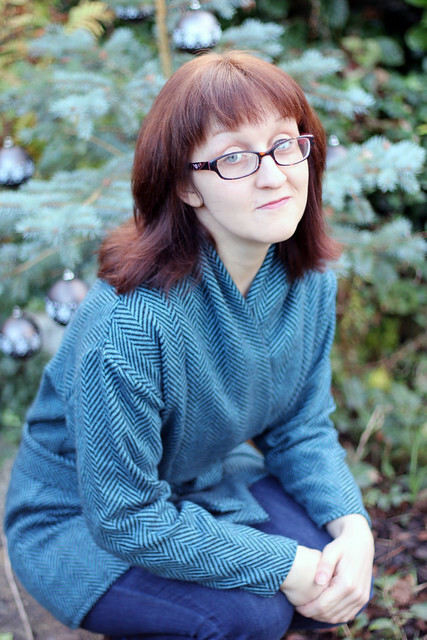 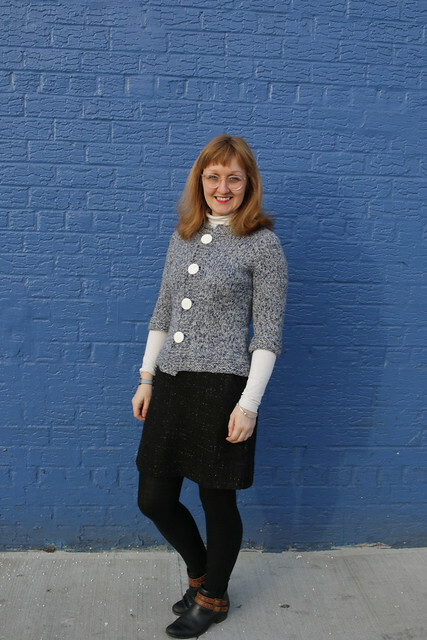 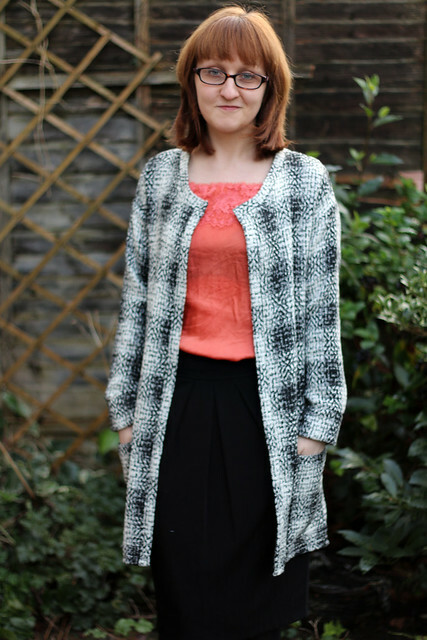 Have you seen the newest pattern from Paprika Patterns, the Opal Cardigan? 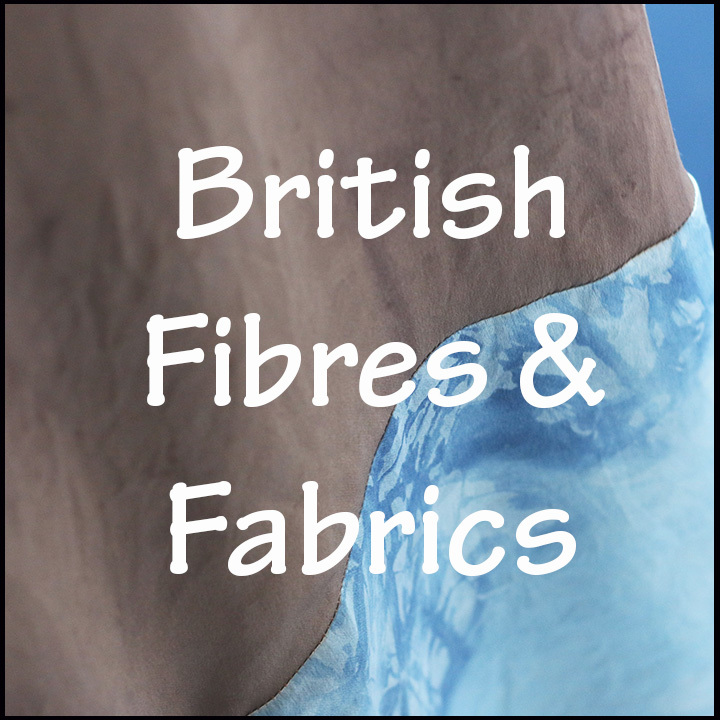 I really love the fabrics Lisa used for the samples pictured in the introductory blog post announcing the pattern. 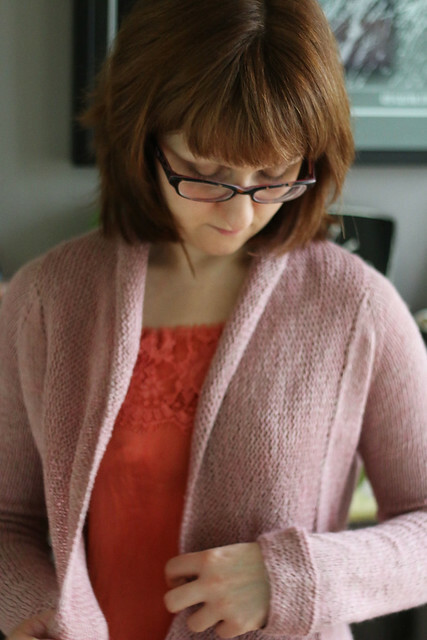 I was a pattern tester for the Opal Cardigan, and the two versions pictured here were made with the test version of the pattern. 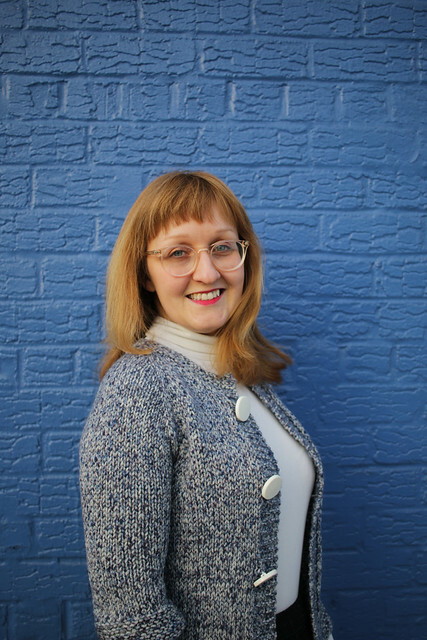 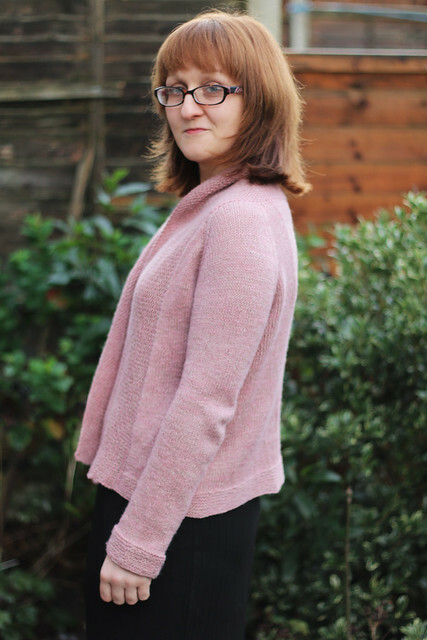 Lisa made a few changes to the final version of the pattern which it’s worth noting: slightly reducing ease, adjusting the angle of the front neckline, the height of the back neckline and raising the pockets. 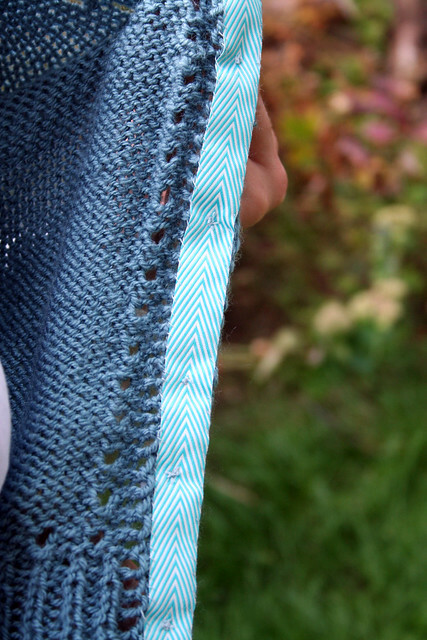 The pattern includes three length options. 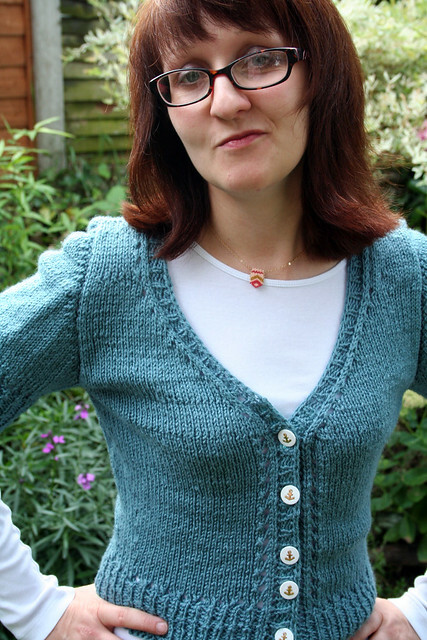 This first version pictured, in a blue ‘warm jersey’ from White Tree Fabrics, is View A, the shortest length. 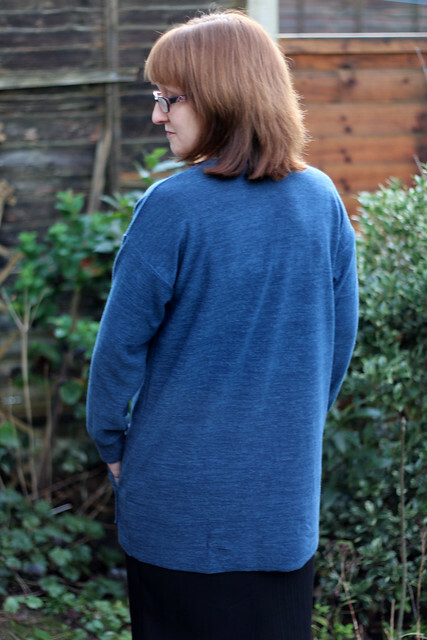 You can see that it is longer on me than on Lisa in the product photos, because I’m quite a bit shorter. 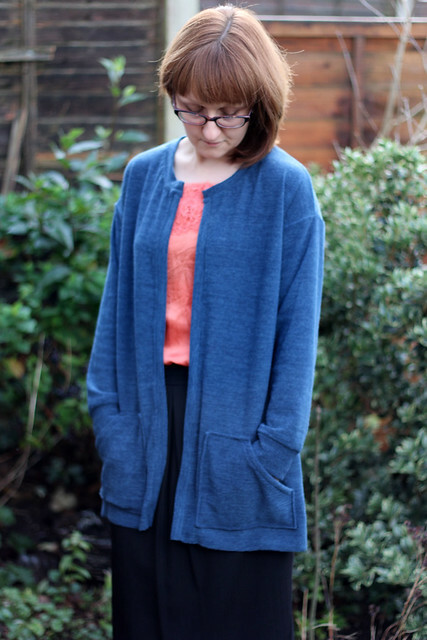 I really like this slouchy length, but it’s worth bearing in mind if you want a hip-length cardigan and are also a shorty like me (I forget how tall I actually am, I think about 5’4). 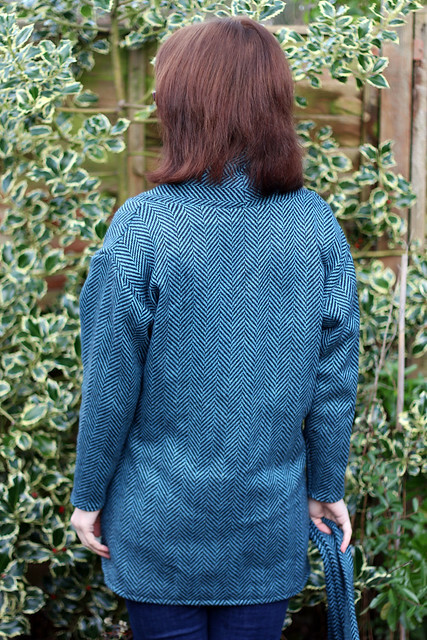 One of my favourite things about the pattern is that each view has a different shaped pocket. 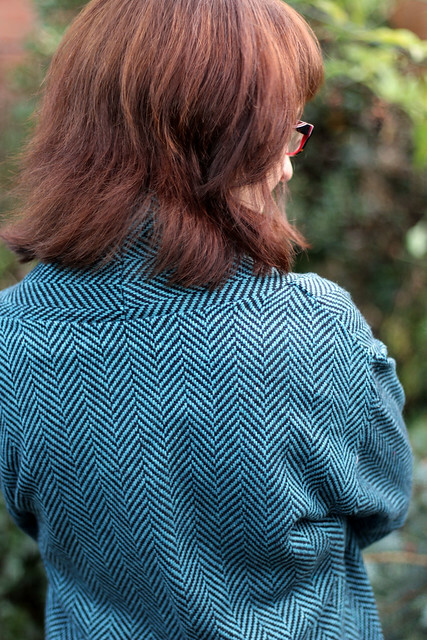 I especially like the View A angled pockets. 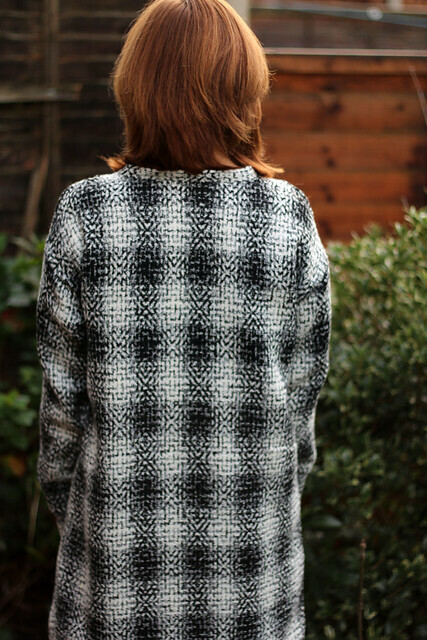 Before I made the knit version above, I made this black and white woven version with fabric from Barry’s. 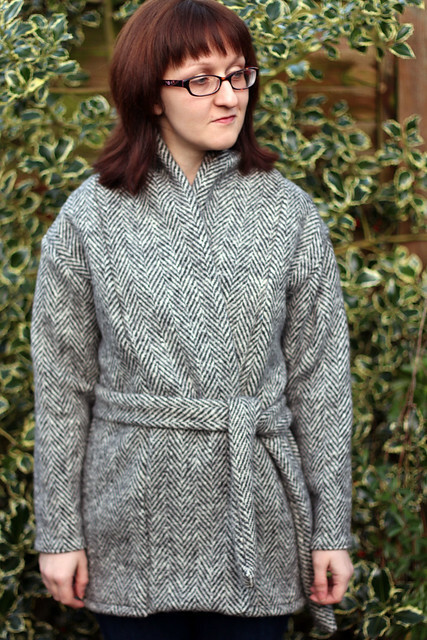 Obviously making a woven version of a knit pattern was not very useful for pattern testing purposes, but I couldn’t resist! 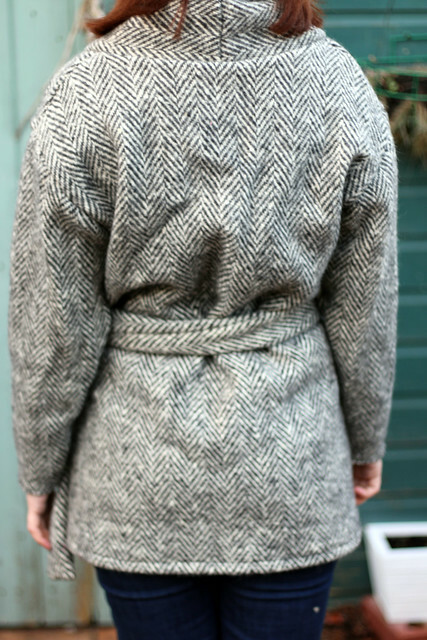 This is View B, the mid-length option. 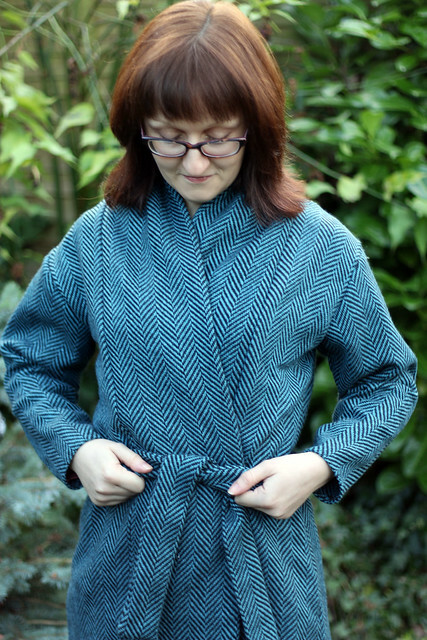 I only made minor tweaks to the pattern to make it suitable for woven fabric – just extending the length of the cuffs and neck binding. 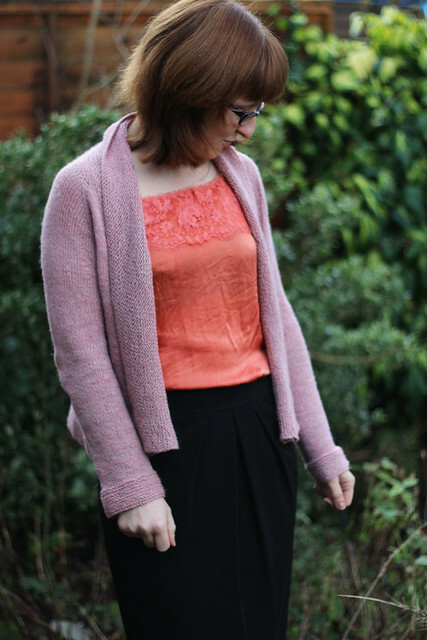 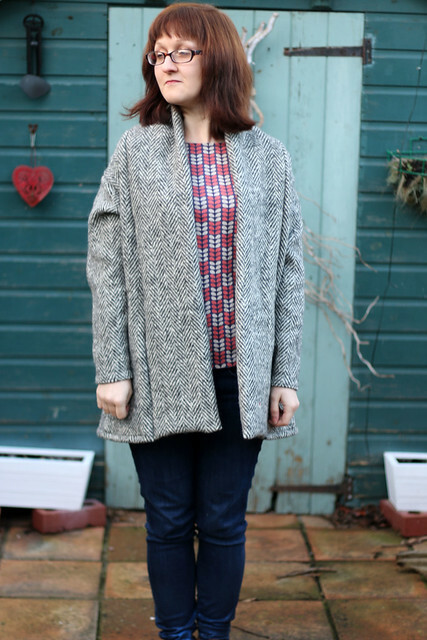 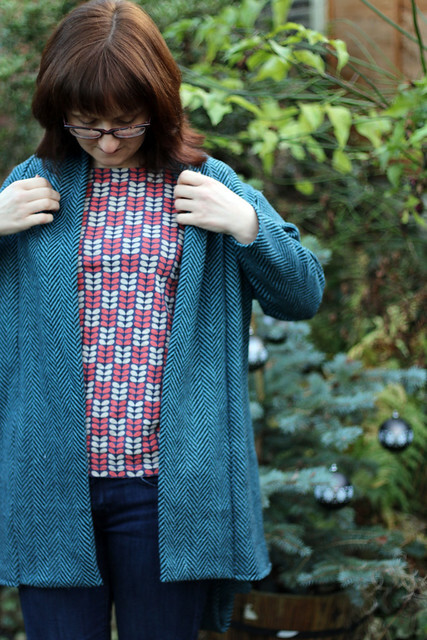 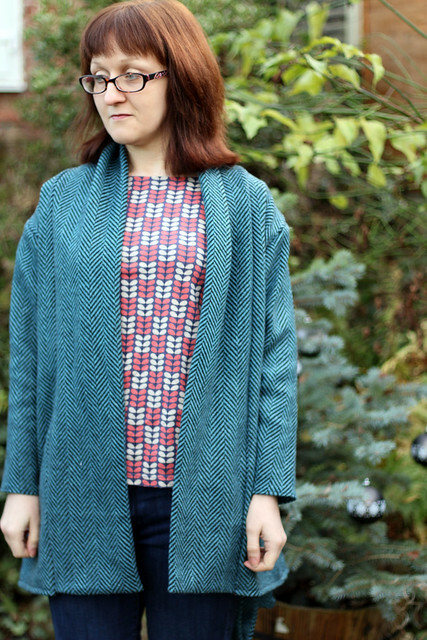 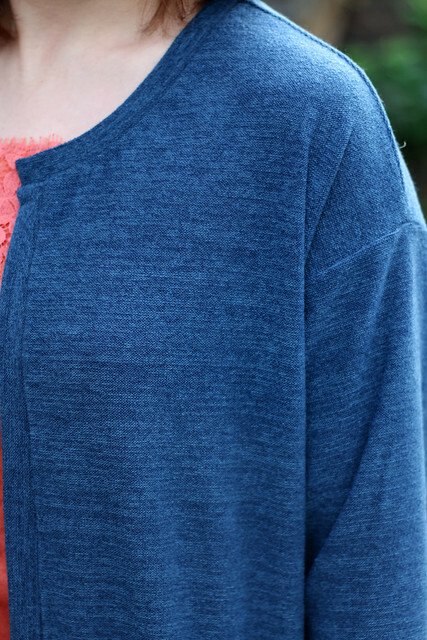 The Opal Cardigan has no fastening so it’s a really quick project. 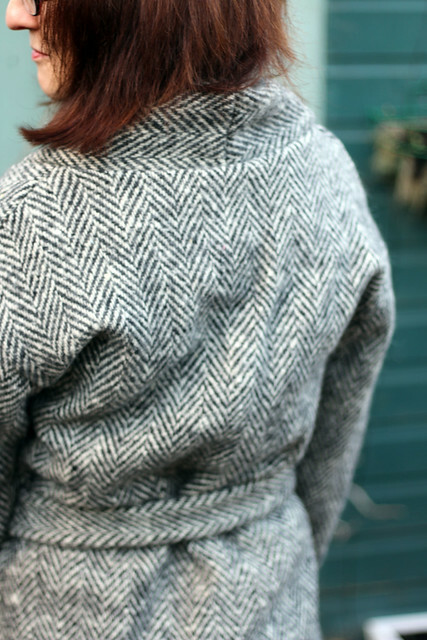 I find it goes with anything and have been throwing mine on in the morning before leaving for the office. 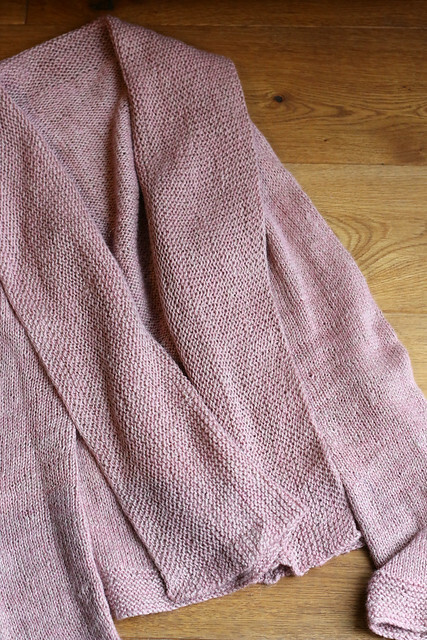 It’s perfect for slipping on and off as the heat fluctuates in our office! 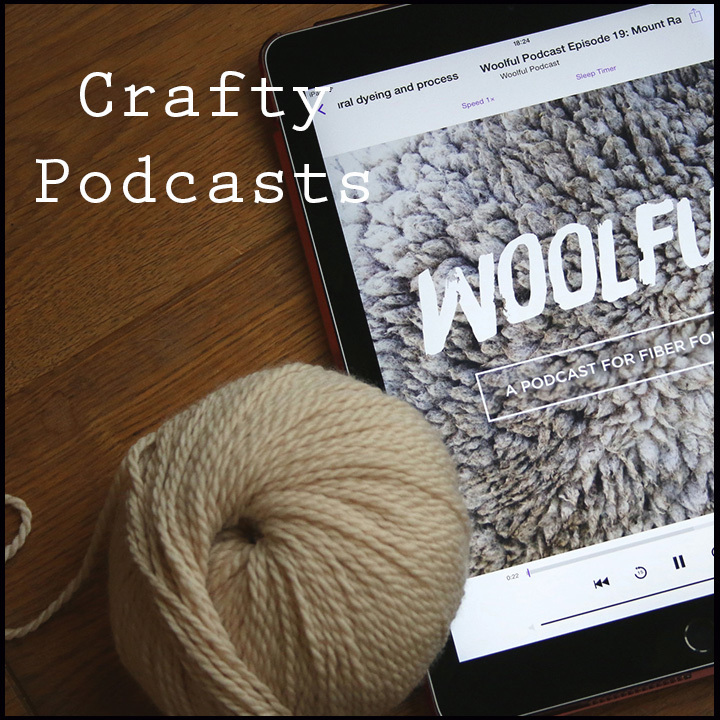 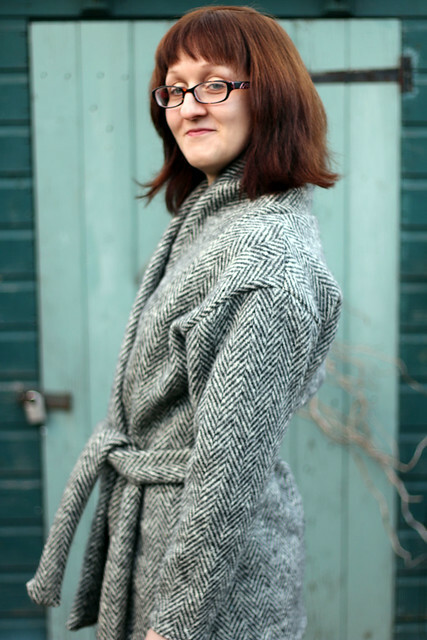 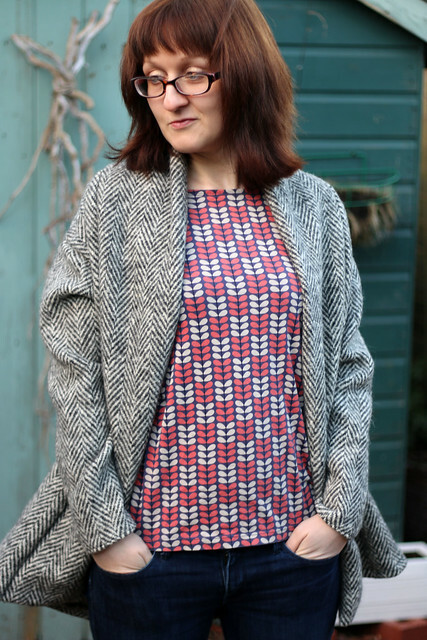 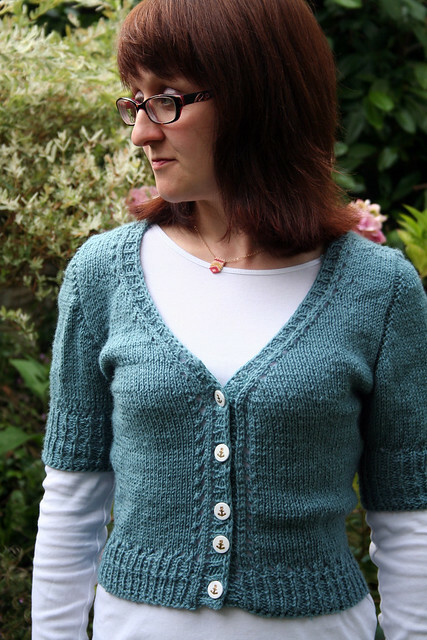 If you fancy trying the pattern, there is currently 15% off until this Sunday, 14th February. 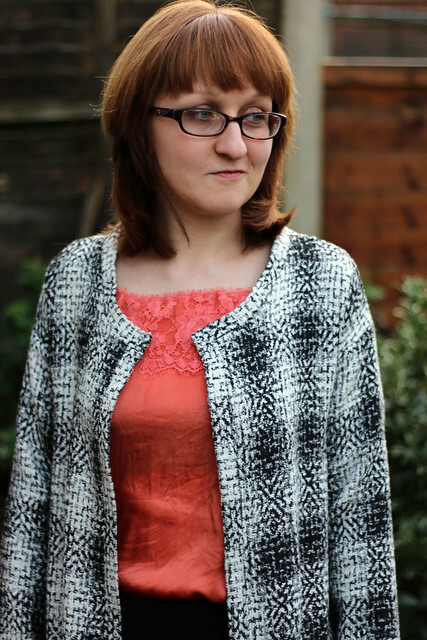 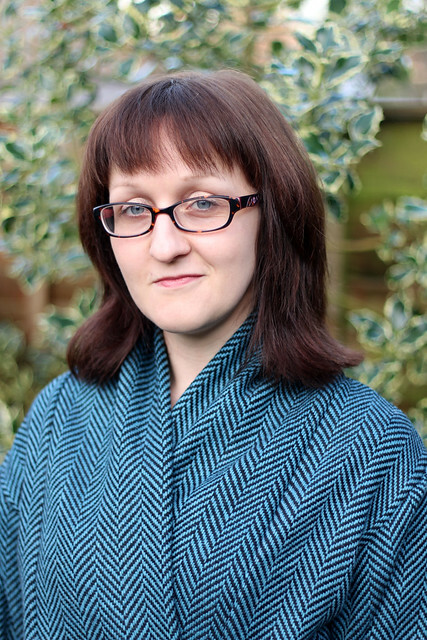 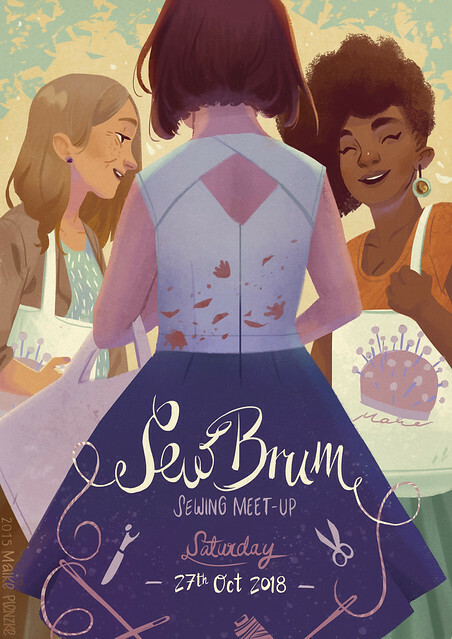 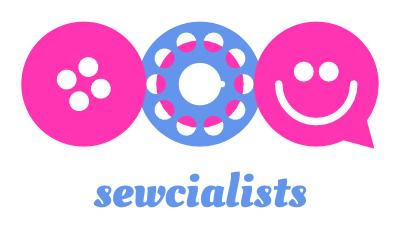 Categories: Sewing | Tags: #indiesewing, Cardigan, indie, Opal, Paprika Patterns, pattern, sew, Sewing | Permalink. 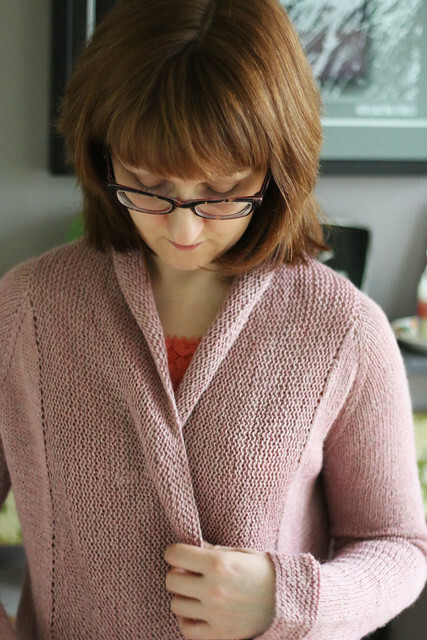 Sooo I started on this Myrna Cardigan by Andi Satterlund around May when Andi and Lauren announced their Outfit Along, and finally finished it at the beginning of August after the OAL deadline. 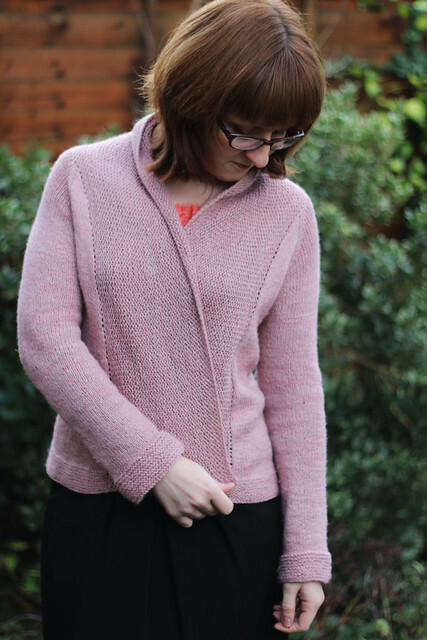 I was a bit worried when I kept reading other bloggers saying it was a very quick project as I certainly wasn’t all that quick getting it finished! 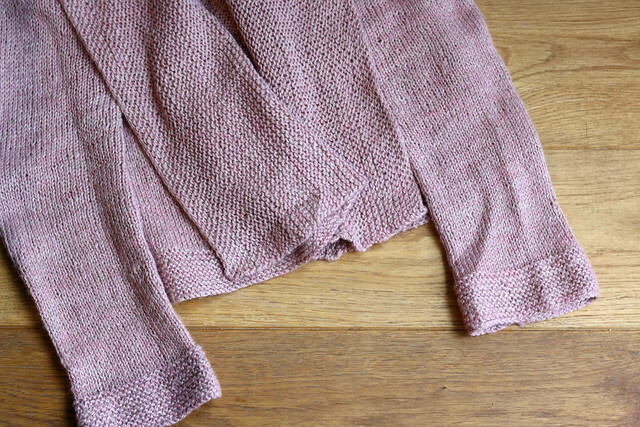 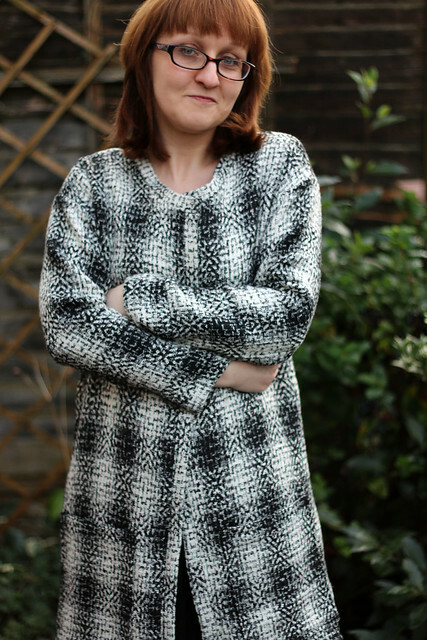 It is only my second knitted clothing project (my first was my Owls jumper) so I’m not too concerned – I’m sure I’ll pick up speed with a few more projects under my belt. 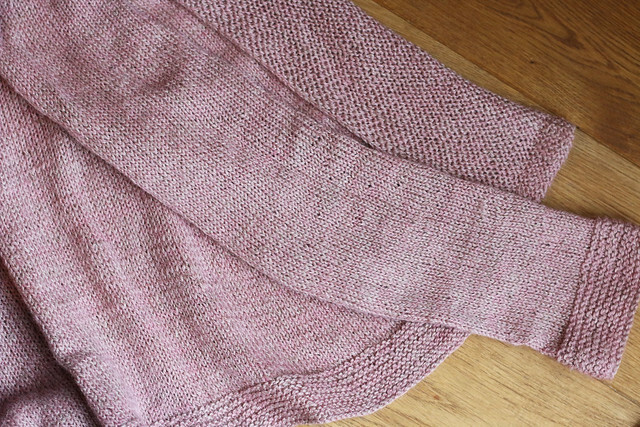 The other thing that slows me down is that I do most of my knitting while travelling. 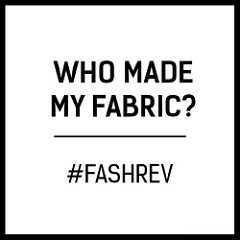 When I’m at home I tend to pick a sewing project. 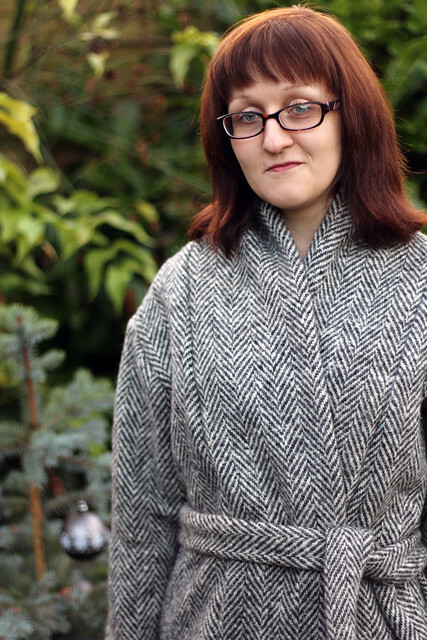 Most of this cardigan was knitted on planes and trains. 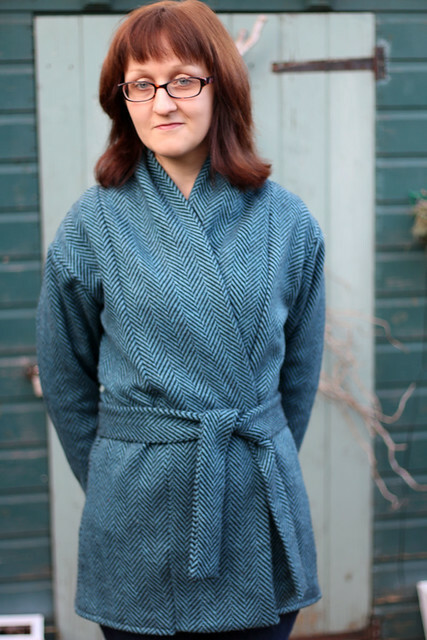 The wool used is the Women’s Institute brand wool now being sold in Hobby Craft stores, in Teal. 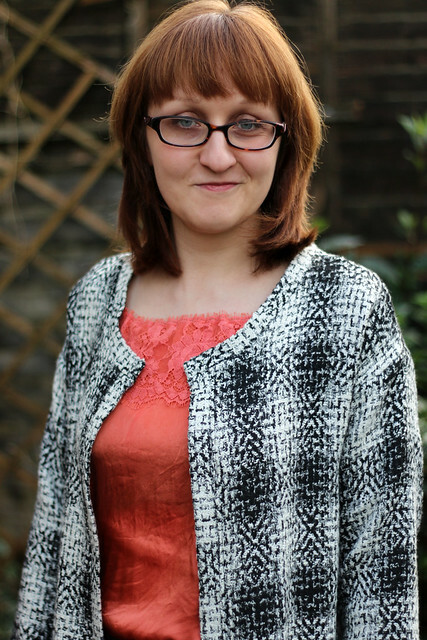 The buttons are white with a gold anchor design and were purchased in the Birmingham Rag Market. 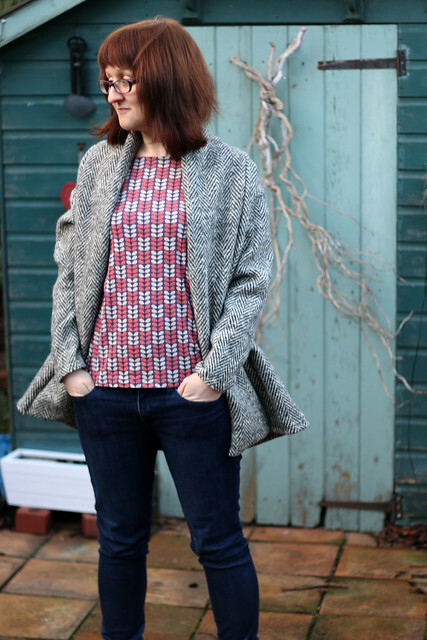 The little necklace you can see in the picture below was a present to myself from Oliver Bonas. 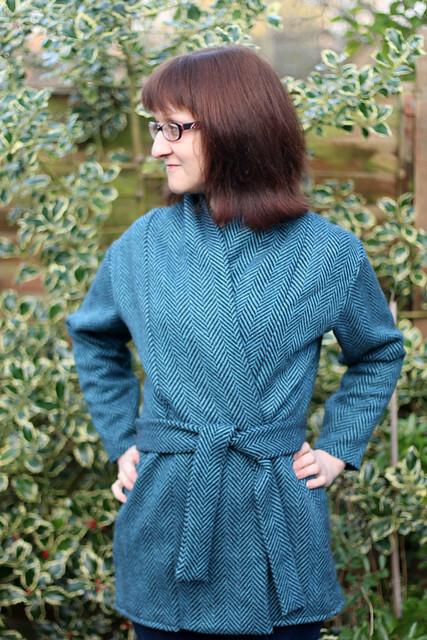 To strengthen the button band I attached ribbon to the reverse using this tutorial by Lladybird. 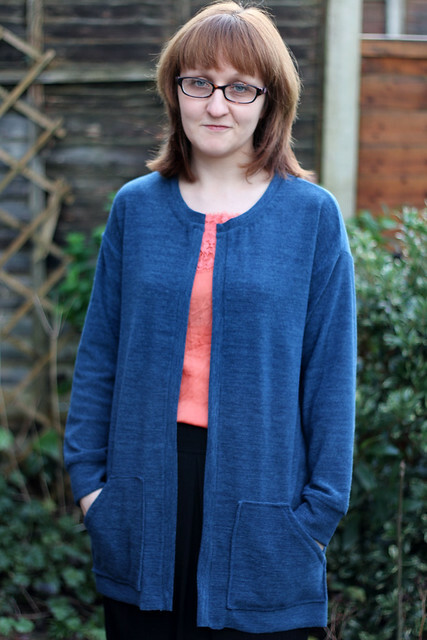 It’s worked really well to stop the cardigan front stretching out. 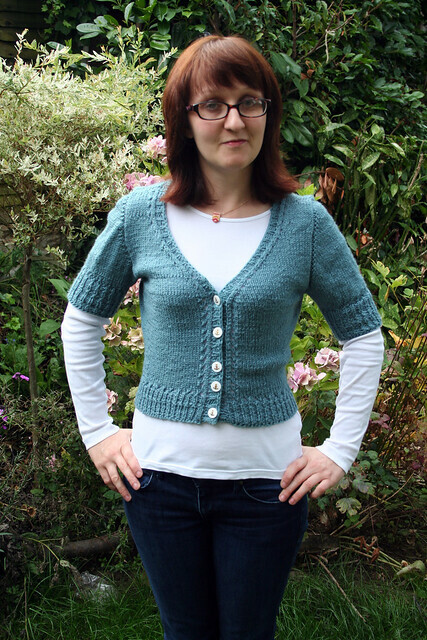 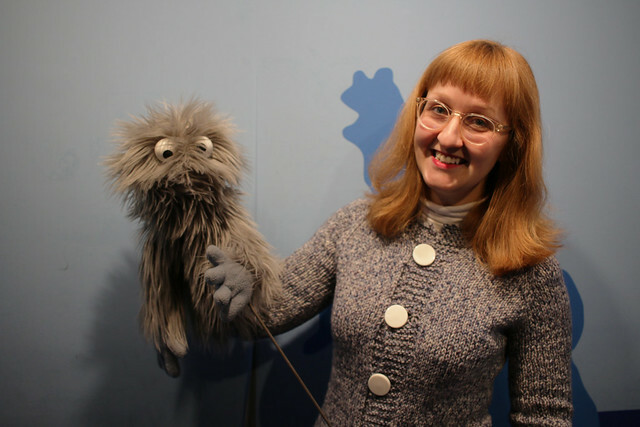 Categories: Knitting | Tags: anchor, Andi Satterlund, blue, Cardigan, knit, knitting, Myrna | Permalink.